A larcenous undercover cop falls for the beautiful moll of a bank robber on the run and together they double-cross the hood and the cops. 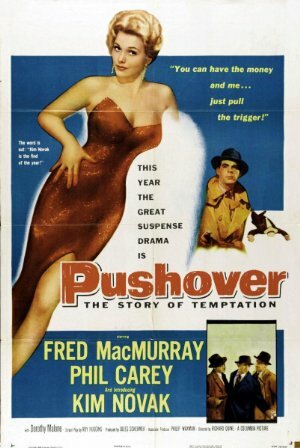 Film Noir of the Week: Streamlined and brisk, Richard Quine's nocturnal 'B' thriller 'Pushover' remains one of noirs lesser-appreciated 'dirty-cop' entries - despite it's boasting strong writing, directing, and two fine lead performances from respectively; Fred MacMurray, in a nice companion piece to his lustful dupe role in Double Indemnity; and fledgling screen siren Kim Novak, who brings a sleek modernity to the noir vixen. Having fallen for the breathtaking young girlfriend of the vicious bank robber he's assigned to nab, broke middle-aged cop Paul Sheridan (MacMurray) agrees to put kept dame Leona's (Novak) suggested plan into motion - and murder the thug when he sneaks back to collect her, before making his way with her and the thug's ill-gotten gains to the exit from his quiet desperation. In the cleverly-constructed script (by 'Fugitive' creator Roy Huggins), Sheridan is the one over-seeing the stakeout of Leona's apartment - in anticipation of her man's return from being on the lam - but as the secret lovers near their goal they must navigate dangerous waters - populated with Paul's fellow officers, their hard-nosed captain (an irritating E.G. Marshall), and the object of Paul's partner's affection (Dorothy Malone). A refreshing and decidedly more romantic variation on the murderous love-triangle blueprint - 'Pushover's Paul and Leona appear to genuinely care for one another. Not simply a tale of illicit lovers double-crossing each other - 'Pushover's plot concerns a star-crossed pair's attempt to put one over on life itself – leaving their respective stale existences behind for a life of warm love and cold cash – and all to the strains of Arthur Morton's maddeningly catchy score. NYTimes: Mr. MacMurray's present solo is a respectable but tame one. We can still hear Miss Stanwyck reminding him, through clenched teeth, "Don't you ever forget we're in this thing together—straight down the line." Slant: Quine neatly rips on the old Keystone Cops gag of people coming in and out of doors, which visually dramatizes MacMurray's quicksand crisis. The film needs this show because MacMurray doesn't exactly work to make the audience feel his ethical conundrum emotionally.